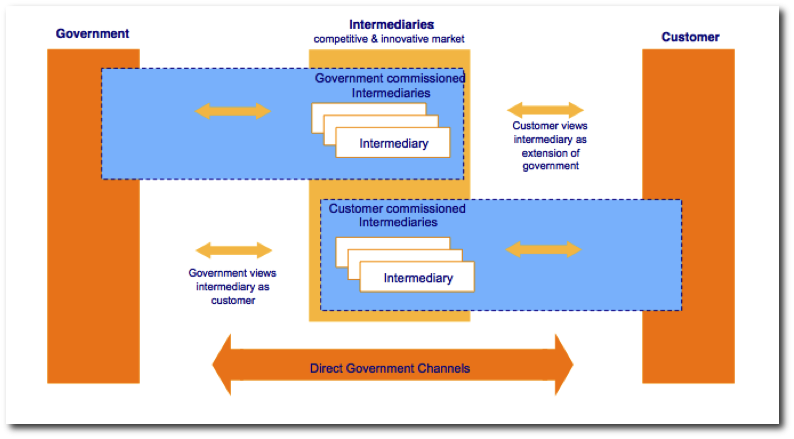 This is part 3 in my occasional blog summarising the past 20 years or so of UK efforts to move government online. The previous parts provided summaries on progress towards a single online presence and a similar high-level summary of the overall architectural thinking. Several demonstrators and pilot programmes making use of smart cards were developed by the Central IT Unit (CITU) during the mid to late 1990s, including one that modelled potential electronic voting in a London-wide election and another that modelled notifying government once of a change of address. These used Royal Mail’s Viacode and Barclays Bank Endorse smart cards. The logical schematic of the change of address demonstrator, which used XML and other open standards such as HTTPS, LDAP and SMTP, is shown below. 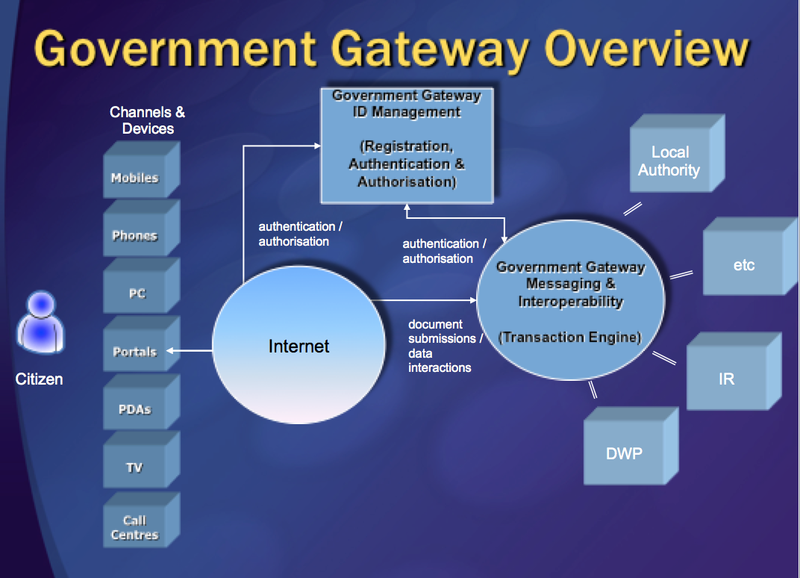 In 2001, the UK Government Gateway was launched, providing a range of transaction management and identity-related services to turn policy into reality. As mentioned in Part 2, the Gateway provided the infrastructure required to connect government into the federated identification and authentication services being provided by third parties via smart cards — such as Barclays Endorse, Royal Mail’s ViaCode and certificates being issued by the British Chambers of Commerce. When the smart card market largely collapsed in the fallout from the dotcom boom and bust, the Gateway ended up primarily using UserIDs and passwords — limiting the level of services that could be used (since UserIDs and passwords were not capable of establishing the levels of trust and authentication possible with smart cards). In addition, it provided reliable, secure, two-way transactional synchronous and asynchronous messaging between citizens, businesses, intermediaries and government — including, where appropriate, the authentication of those messages. Registration: This is the process by which a client gains a credential such as a username or digital certificate for subsequent authentication. This may require the client to present proof of real-world identity (such as birth certificate, passport) and/or proof of other attributes depending on the intended use of the credential (eg proof that an individual works for a particular organisation). Registration can be associated with a real-world identity or can be anonymous or pseudonymous. Authentication: The process by which the electronic identity of a client is asserted to, and validated by, an information system for a specific occasion using a credential issued following a registration process. It may also involve establishing that the client is the true holder of that credential, by means of a password or biometric. A client is required to authenticate their electronic identity every time they wish to engage in an UKonline session. The main purpose of the model was to establish the framework for the federated identity system, setting out the approach to the provision of all or part of e-government services by third parties, including obligations on third parties for registration and authentication. It also set out the various trust models for registration and authentication. It further clarified the requirements both for initial registration and subsequent authentication across a range of government services. An updated version, Version 3, appeared in 2002, and incorporated comments received after a public consultation exercise. Anyhow, back to our story … The Gateway’s identity services were later enhanced to support EMV (the chip and PIN standard developed by Europay, MasterCard and Visa and widely used for for authenticating credit and debit card transactions). In parallel with these developments, and in apparent conflict with the earlier approach to a federated identity model, the government decided to pursue the development of a single national identity card that would be issued by the state. After many years of encouraging the growth of an ecosystem of identity providers and intermediaries, this model would have instead imposed a single identity for use with government services. These proposals for a single identity card formed part of the National Identity Scheme in 2005. It’s outside the scope of these overview 101’s to go into the pros and cons of what was proposed, so for anyone interested in more detail have a look at Wikipedia’s summary. Under the terms of the Identity Documents Act 2010, identity cards ceased to be legal documents on 21 January 2011. Since the general election in 2010, a familiar model has been proposed, one that returns to the earlier desire for a federated identity system. 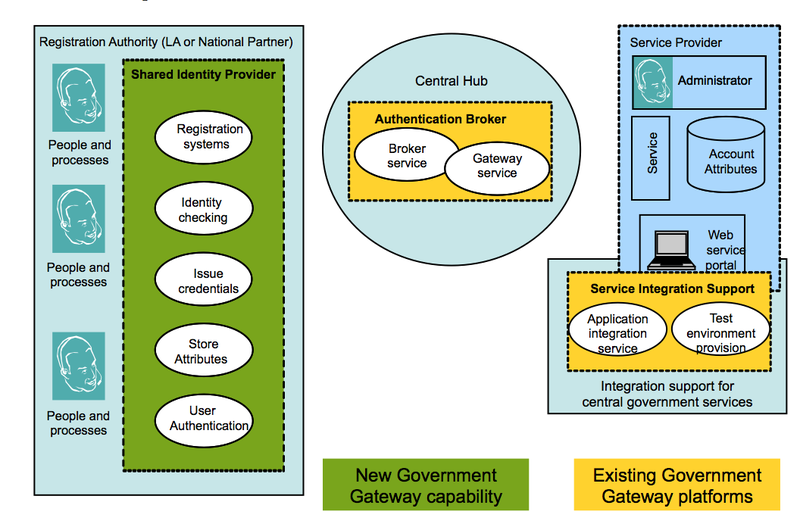 The Government Digital Service (GDS) is running the identity assurance programme (IDAP) and is both developing the technical standards needed to implement a replacement federated identity model for the Government Gateway (which is due to end providing services in 2016) and putting into place the ecosystem of third party identity providers required to make it happen. GDS has also recently announced a further initiative to bring in more identity providers, to further expand the choice open to citizens and businesses in the future. 2. no centralised identity database – instead, to protect users’ privacy, each identity provider will be responsible for securely and separately holding data about the users that have registered with them. Each government department service will only have access to the data it needs. 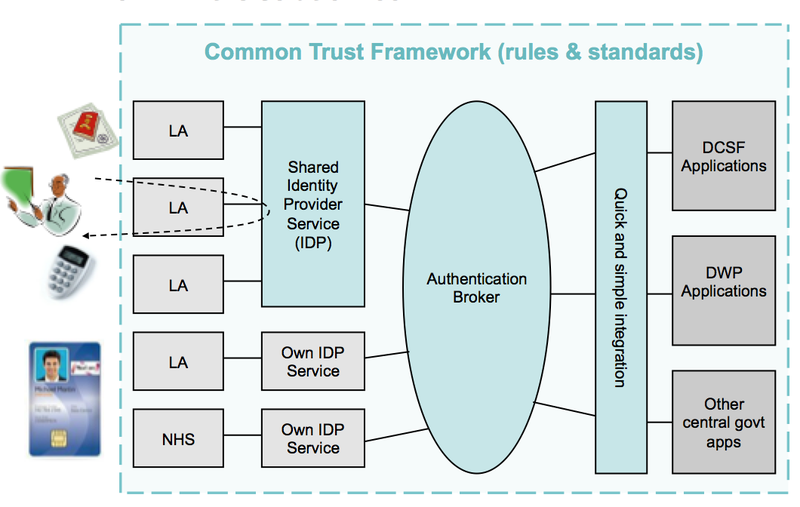 4. developing a market – we’re giving identity providers freedom to design services to meet the standards. This will allow them to develop services that can be used by the wider public and private sector, which will help to reduce costs. The independent Privacy and Consumer Advisory Group has also been providing guidance and advice to GDS to help ensure they’re designing a service based on user choice, control and privacy — and that there is an easy to use route to fix problems if they arise. 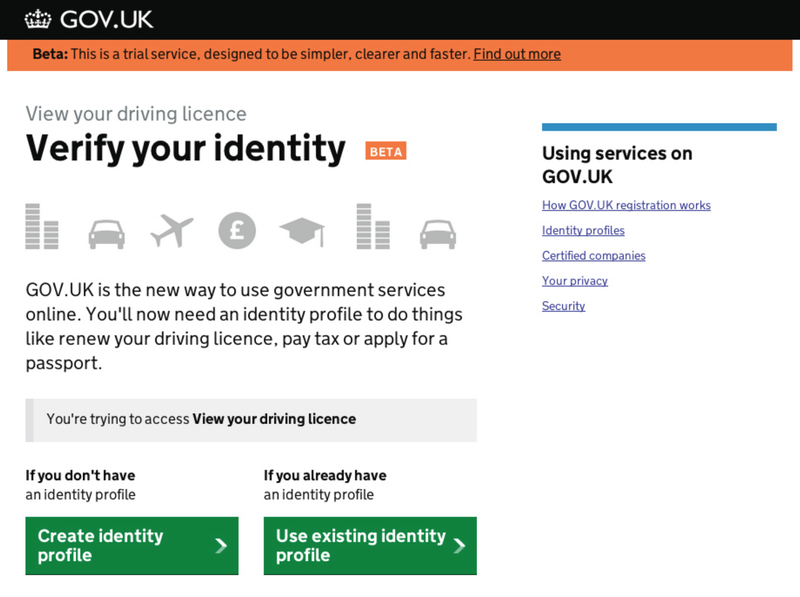 The new identity service is already in live private beta with two exemplar government digital services — HMRC’s PAYE and DVLA’s view driving record service. These are being progressively tested, developed and improved prior to being moved into public beta. The intent is that over the next few years online identity provision will adopt the new federated identity service. Users of the Government Gateway identity services will be progressively migrated to the new service, ahead of the Gateway infrastructure being wound down and eventually decommissioned. So, if all goes to plan, over the next few years we should see a modern version of the original federated identity model foreseen back in the 1990s. The technology may have changed from that originally envisaged — of smart cards and PKI — to one of chip and PIN and other potential mechanisms, but the intended outcomes remain largely the same: to enable citizens and businesses to use online government services in a trusted and secure way.